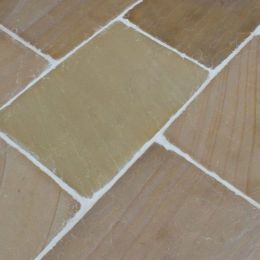 Minster Sand Antique Flagstones have hand-dressed edges along with a tumbled and gently brushed surface. Natural sandy/brown tonal variances and interesting Golden rust patterning run throughout this range. 20mm thick, suitable for indoor and outdoor use.